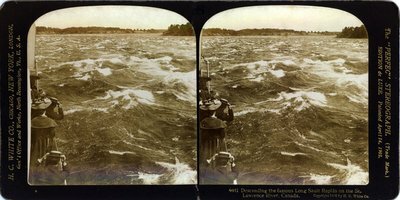 Stereoview of passengers clutching their hats as the steamboat descends the Long Sault Rapids of the Saint Lawrence River. "9441 Descending the famous Long Sault Rapids on the St. Lawrence River, Canada. Copyright 1906 by H. C. White Co."
Gen'l Office and Works, North Bennington Vt., U.S.A."
Edition de Luxe, Patented April 14, 1903." "Descending the famous Long Sault Rapids on the St. Lawrence River, Canada. Descente des fameus rapides Long Sault sur le fleuve St. Laurent, Canada. Descendiendo el famoso recial "Long Sault" en el rio San Lorenzo, Canada. Fahrt stromabwärts durch die "Long Sault" Stromschnellen des Sankt Lorenz Stromes, Kanada. Utför de ryktbara Long sault-fallen på St. Lawrence-floden. Kanada. We are now in the most exciting part of our trip down the St. Lawrence from Kingston to Montreal. We have already had some experience of the turbulence of the river in passing the Galoups Rapids and the Rapide Plat, about thirty-five and forty miles back. But neither of these was particularly noticeable, and as we pass into the narrowing arm of the river between the Long Sault island and the Canadian shore, we enter the wildest rapids on the entire St. Lawrence River, possibly surpassing the famous Lachine Rapids near Montreal. How the whirling water foams and dashes, one short wave flinging itself against the next with a swirl of whitening foam, until the broad expanse looks like some half-frozen sheet of water. The steam is shut off, but the current sweeps our boat along at twenty miles an hour. The Indian pilot, a descendant of the boatmen who once guided their frail canoes down this eddying course, steers us carefully by a hidden groups of rocks covered by a cap of foam, or sheering suddenly avoids a long projecting rock, which threatens us as we drive by. All fear is soon forgotten in the excitement of the rush and the roar of the water, and we are surprised at the smoothness with which the boat glides down the nine miles of rapids. Yet the trip is not without peril, as that wrecked raft we passed a short distance back, caught on a granite ledge, suggests so plainly. The first large steamboat to run the St. Lawrence rapids was the Ontario in 1843. The Indian pilots who took her through, first sent down a strongly built float, with ten-foot stakes projecting downward from the bottom. At the foot of the rapids it was turned over and not a stake was broken. Satisfied with this test, the Indians piloted the steamboat along the course the float had taken with perfect safety. See G. W. Browne's The St. Lawrence River.